There is a great tool available which can ease your digital life. If This Then That allows you to create recipes which link web services together. A recipe comprises a trigger, and an action to take when the trigger is set. The trigger is an event which you can define associated with the web service. In addition you can chose to be notified when the trigger has happened. For example, I have a recipe which is set to automatically post to my FaceBook timeline whenever I publish a new post on my WordPress blog. I could do it myself, I suppose, but as you can see, I also create a post on Tumblr, in addition I create a tweet. 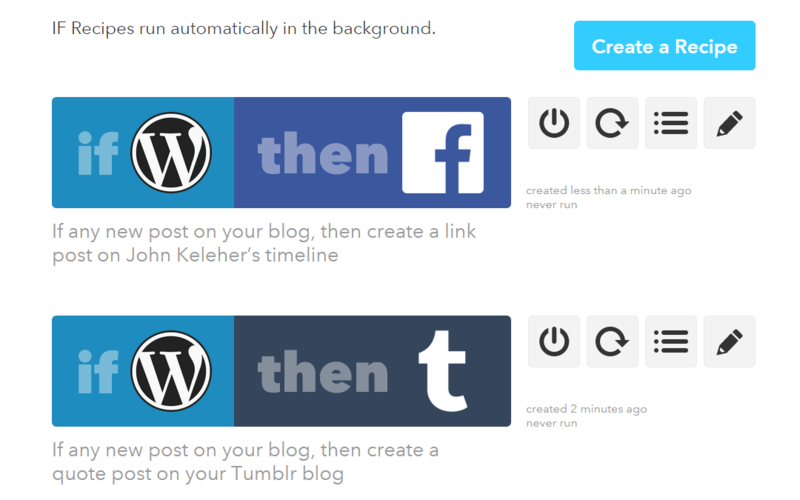 So, using IFTTT saves me a bit of time. I also have a recipe which saves all email attachments I receive in my google account mailbox, and save them in a folder on OneDrive. New services are being added to IFTTT regularly, just recently elements of Office 365 have been added – Outlook Email Calendar and Contacts, and OneDrive for Business. So you could, if you wanted to, send a welcoming email to someone you created as a contact in Outlook. If you want to try a recipe which isn’t related to work, you can set one up to email you any photographs you take on your android phone, or to add a music track to a spotify playlist. IFTTT apps are also available for iOS, Android and WindowsPhone. On iOS and Android they are branded IF and DO.